When Vick Ballard was announced out for the season on Friday, Colts Owner Jim Irsay tweeted that Ryan Grigson would be working hard until the trade deadline to find another running back. Grigson’s work came to fruition on Wednesday evening as the Colts acquired Browns running back Trent Richardson for the Colts 2014 first-round pick. 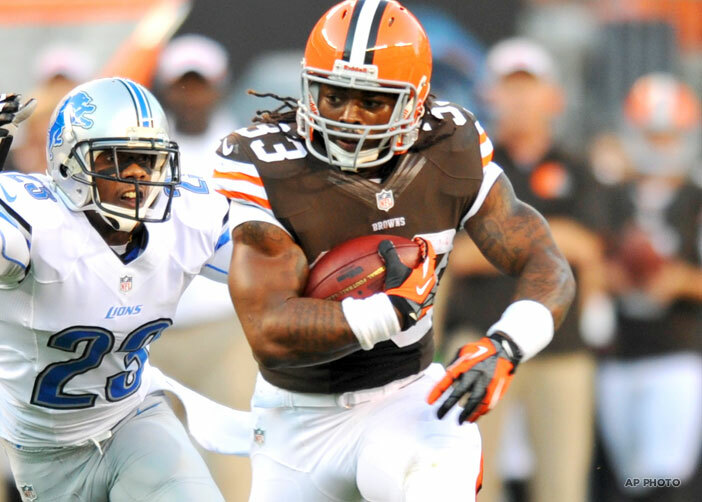 How does Trent Richardson’s acquisition impact the Colts backfield? At 225 pounds, Richardson is a multi-faceted running back who is in his second NFL season. In his rookie season in 2012, Richardson rushed for 957 yards on 267 carries in 15 games. He caught 51 passes for 367 yards and scored a total of 12 touchdowns (11 rushing). For the Browns last year, Richardson was their main offensive threat and all three of his 100-yard rushing games in 2012 came against the AFC. Richardson had five of his 11 rushing touchdowns in the month of December. Richardson, an Alabama product, will now join Ahmad Bradshaw in the Colts backfield to give the Colts a bonafide 1-2 punch that rivals any backfield in the NFL. The addition of Richardson comes at a critical time for the Colts offense with three starters suffering season ending injuries in the last six days. Offensive coordinator Pep Hamilton has talked at length about establishing a power-rushing game and there isn’t a young back in the NFL that fits that mold more then Richardson. Expect Richardson to make an impact right away with the Colts offense and help Indianapolis establish a balanced offensive attack that they have been searching for. Richardson now bolsters an already loaded Colts group of second-year players including Andrew Luck, Coby Fleener, Dwayne Allen, T.Y. Hilton and Vick Ballard. -In arguably the most exciting game of the weekend, the Texans overcame a late fourth quarter interception and an injury to Andre Johnson. Quarterback Matt Schaub threw an interception with 4:59 remaining, which gave the Titans a 24-16 lead. The Texans answered with an Arian Foster one-yard touchdown run with just under two minutes left and Foster’s two-point conversion tied the score. Houston missed a last second field goal to win the game in regulation but with the flip of the coin toss, the Texans wouldn’t miss another opportunity. On the opening drive of overtime, Schaub found rookie wide receiver DeAndre Hopkins for a three-yard game-winning touchdown. -The Titans looked prime to take the AFC South lead with a huge road divisional win over the two-time defending champs. However, that 24-16 lead with under five minutes to play evaporated thanks to Foster’s touchdown run. Tennessee quarterback Jake Locker threw for two touchdowns but finished the game just 17-of-30 for 148 yards. An Alterraun Verner interception late in the fourth quarter gave the Titans an eight-point lead but the defense could not garner up one final stop. -It was a struggling afternoon for the Jaguars offense. While the Jacksonville defense hung tough in the red zone, the Jaguars offense barely got into the opponent’s 20-yard line. Jaguars quarterback Chad Henne was 25-of-38 for 241 yards, one touchdown and no interceptions. Jaguars running back Maurice Jones-Drew was held to 29 rushing yards on 10 carries and his counterpart, Darren McFadden had 19 carries for 129 rushing yards. The Jaguars lone touchdown came with 2:53 left in the fourth quarter when Henne found Clay Harbor for a 13-yard touchdown. NEXT GAME: @Seattle, Sunday at 4:25 p.m. EST. The Colts practice schedule for the 49ers begins this afternoon. Today’s news is pretty quiet but here are a couple of observational pieces on Ahmad Bradshaw and Pep Hamilton’s offense. Take a look below at the top pieces from Wednesday, September 18th. Holder points to the play of new running back Ahmad Bradshaw as a positive from Sunday’s game. But now that we’ve gotten a closer look at Bradshaw, here are my observations. * He’s got good vision. Bradshaw’s ability to both follow blocks and anticipate how a play will unfold allowed him to pick up extra yards that he otherwise might not have. Bradshaw showed a knack for knowing there the crease was going to be, often before it even developed. This allowed the Colts to move the chains even in instances where they didn’t necessarily have perfect run blocking. * Bradshaw had a lot more pop than I expected. He showed, perhaps, more quickness than we gave him credit for, and that allowed him to hit the hole the moment it opened. * Finally, Bradshaw still has that trademark toughness we’ve always seen from him. Put simply, he runs hard, punishing defenders who dare try to tackle him. Chappell also gives some observations and his come on the offensive side of the ball looking at Pep Hamilton’s scheme. • “Chunk plays,” the over-the-top strikes so prevalent in 2012, will be less frequent. After two games, Colts receivers rank 16th in the league, averaging 11.6 yards per reception. They were No. 3 last season, averaging 12.9 yards, the club’s sixth-best per-catch average since 1970. Only three of Andrew Luck’s 43 completions have gained at least 25 yards, tied for eighth-fewest in the league. Philadelphia’s Michael Vick has a league-high 10 and Green Bay’s Aaron Rodgers nine. • When chunk plays occur, T.Y. Hilton figures to be the target on the majority of them. Among receivers with at least nine receptions, Hilton’s 16.2 average ranks 13th. His acrobatic 47-yard grab against the Miami Dolphins is Luck’s longest completion this season, and the latest evidence that coordinator Pep Hamilton should maximize Hilton’s big-play skills.